A sophisticated spaceship in orbit around an alien world has been firing its advanced ion engine to execute complex and elegant orbital acrobatics. 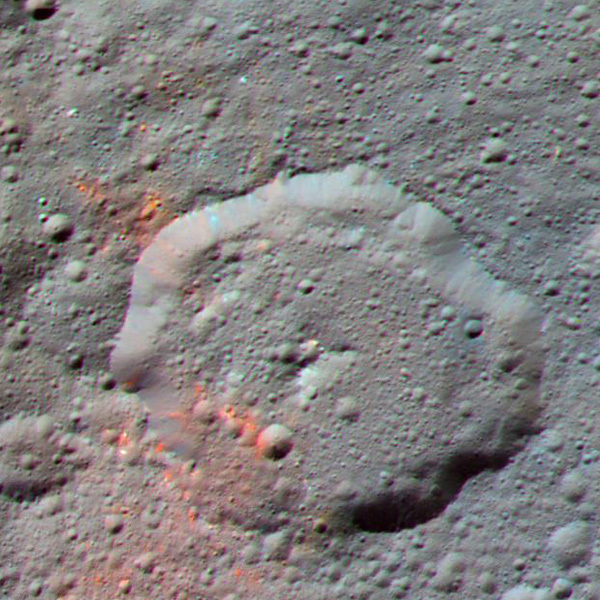 On assignment from Earth at dwarf planet Ceres, Dawn is performing like the ace flier that it is. The spacecraft’s activities are part of an ambitious bonus goal the team has recently devised for the extended mission. Dawn will maneuver to a location exactly on the line connecting Ceres and the sun and take pictures and spectra there. Measuring the opposition surge we explained last month will help scientists gain insight into the microscopic nature of the famous bright material in Occator Crater. Flying to that special position and acquiring the pictures and spectra will consume most of the rest of the extended mission, which concludes on June 30. This month, we will look at the probe’s intricate maneuvers. Next month, we will delve more into the opposition surge itself, and in April we will describe Dawn’s detailed plans for photography and spectroscopy. In May we will discuss further maneuvers that could provide a backup opportunity for observing the opposition surge in June. First, however, it is worth recalling that this is not Dawn’s primary responsibility, which is to continue to measure cosmic rays in order to improve scientists’ ability to establish the atomic species down to about a yard (meter) underground. Sensing the space radiation requires the spacecraft to stay more than 4,500 miles (7,200 kilometers) above the dwarf planet that is its gravitational master. The gamma ray and neutron detector will be operated continuously as Dawn changes its orbit and then performs the new observations. The ongoing high-priority radiation measurements will not be affected by the new plans. 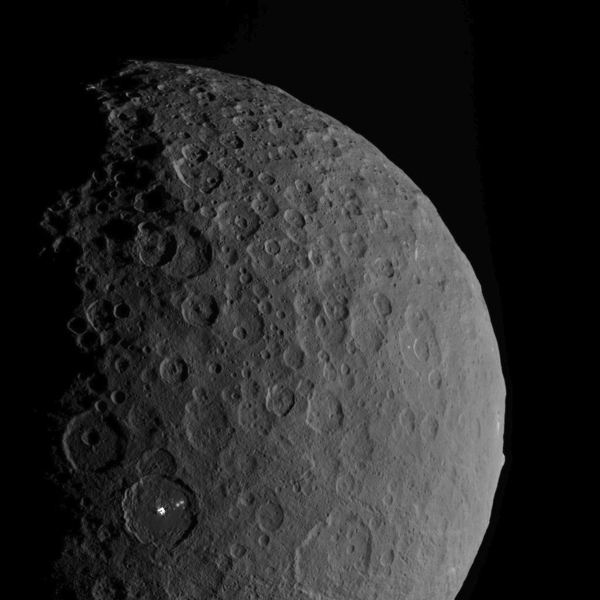 The principal objective of the orbital maneuvers is to swivel Dawn’s orbit around Ceres. 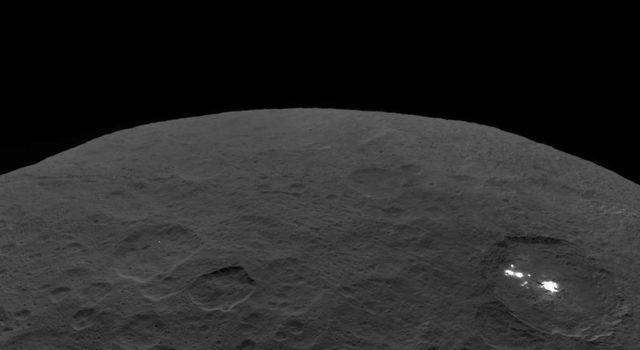 Imagine looking down on Ceres’ north pole, with the sun far to the left. (To help your imagination, you might refer to this figure from last month. As we will explain in May, Dawn’s orbital plane is slowly rotating clockwise, according to plan, and it is now even closer to vertical than depicted in January. That does not affect the following discussion.) From your perspective, looking edge-on at Dawn’s orbit, its elliptical path looks like a line, just as does a coin seen from the edge. In its current orbit (labeled 6 in that figure), Dawn moves from the bottom to the top over the north pole. When it is over the south pole, on the other side of the orbit, it flies from the top of the figure back to the bottom. The purpose of the current maneuvering is to make Dawn travel instead from the left to the right over the north pole (and from the right to the left over the south pole). This is equivalent to rotating the plane of the orbit around the axis that extends through Ceres’ poles and up to Dawn’s altitude. From the sun’s perspective, Dawn starts by revolving counterclockwise and the orbit is face-on. We want to turn it so it is edge-on to the sun. That may not sound very difficult. After all, it amounts mostly to turning right at the north pole or left at the south pole. Spaceships in science fiction do that all the time (although sometimes they turn right at the south pole). However, it turns out to be extremely difficult in reality, not to mention lacking the cool sounds. When going over the south pole, from the top of the figure to the bottom, the spacecraft has momentum in that direction. To turn, it needs to cancel that out and then develop momentum to the left. That requires a great deal of work. It is energetically expensive. Fortunately, the ever-resourceful flight team has an affordable way. Suppose you are driving from north to south and want to turn east at an intersection. You have to decrease your southward (forward) velocity somehow; otherwise, you will continue moving in that direction. You also have to increase your eastward (left) velocity, which initially is zero. That means putting on the brakes and then turning the wheel and reaccelerating, which takes work. (If you’re a stunt driver in the movies, it also may mean making smoke come out near the tires.) With your car, there are two major forces at work: the engine and the friction between the wheels and the road. For a spacecraft, the forces available are the propulsion system and the gravity of other bodies (like moons). 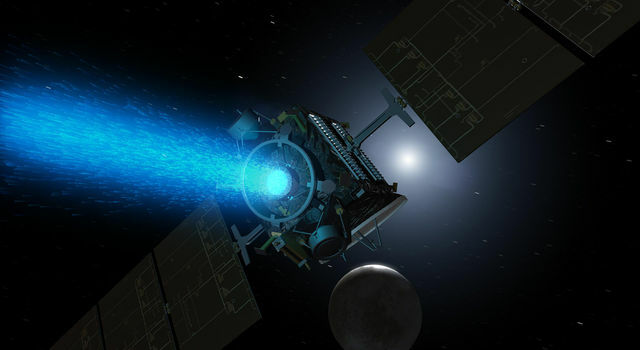 Ceres’ only moon is Dawn itself, and there are no other helpful gravitational forces, so it’s all up to the probe’s ion engine. Dawn was not built to perform these new maneuvers. The main tank and the xenon propellant loaded in it shortly before the spacecraft launched from Cape Canaveral did not account for such an addition to the interplanetary itinerary. The plan was to travel from Earth past Mars to Vesta, enter orbit and maneuver around the protoplanet, then break out of orbit and travel to Ceres, slip into orbit, and maneuver there. Dawn has now done all that with great distinction and already moved around more while orbiting Ceres than originally planned. Indeed, the mission has accomplished far, far more propulsive flight than any other, but now its xenon supply is very low. 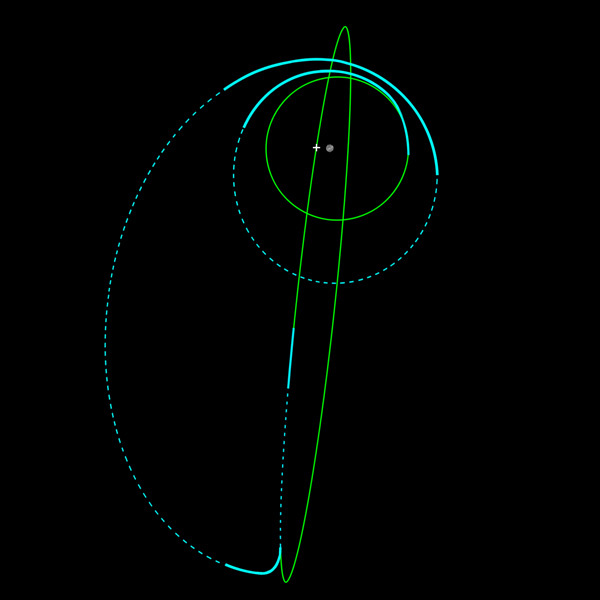 Navigators needed an efficient way to swivel the spacecraft’s orbit, and that meant finding an efficient way to change the direction of its orbital motion. 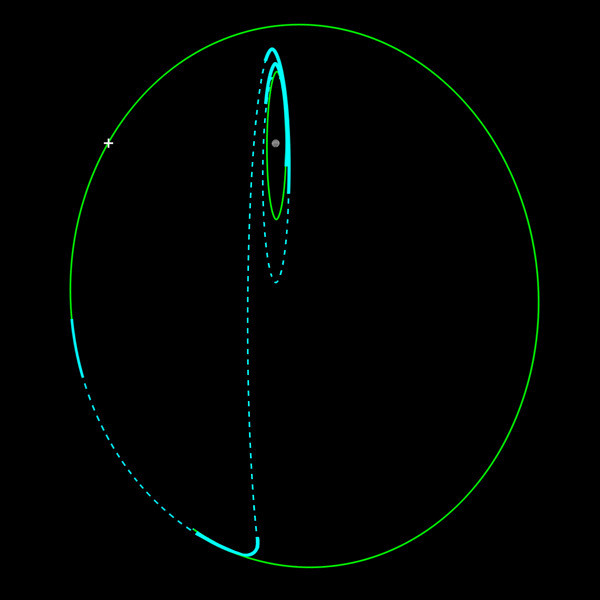 An orbit is the perfect balance between the inward tug of gravity and the fundamental tendency of free objects to travel in a straight line. Orbital velocity thus depends on the strength of the gravitational pull. At low altitude, orbiting objects travel faster than at higher altitude. (We have considered this topic in some detail, including with examples, several times before.) Dawn is flying to a very high altitude, where Ceres’ grip will not be as strong so the orbital velocity will naturally be much lower and therefore easier to change. Then it will turn left and swoop back down for the photo op. Any hotshot spaceship pilot would be proud to fly the same profile. In December 2016, Dawn reached extended mission orbit 3 (XMO3), which ranged in altitude between 4,670 miles (7,520 kilometers) and 5,810 miles (9,350 kilometers). Now the spacecraft is climbing, and it will peak at more than 32,000 miles (52,000 kilometers) in early April when it will pivot the orbit almost 90 degrees. It will then glide down to about 12,400 miles (20,000 kilometers) for the targeted observations. 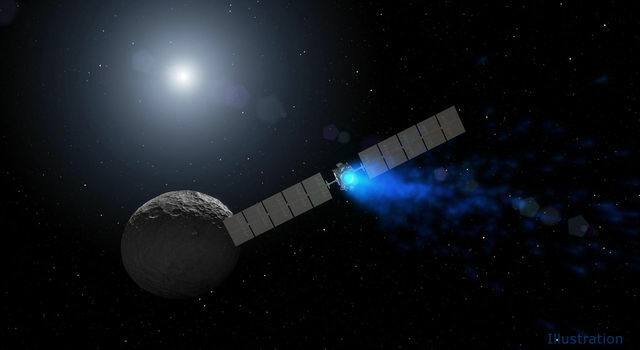 By the time it began ion thrusting last week, Dawn had successfully completed all of its assignments in XMO3. That included three photography sessions. In the last, the spacecraft used the primary and backup cameras simultaneously for the first time in the entire mission. In its extensive investigations of Vesta and Ceres, Dawn has taken more than 85,000 pictures, but all of them had been with only one camera powered on at a time, the other being held in reserve. In April we will discuss the reason for operating differently before leaving XMO3. Readers on or near Earth who appreciate following such an extraordinary extraterrestrial expedition can take advantage of an opportunity this week to do a little celestial navigation of their own. On March 2, the moon will serve as a helpful signpost to locate the faraway ship on the interplanetary seas. From our terrestrial viewpoint, the moon will move very close to Dawn’s location in the sky. The specifics, of course, depend on your exact location. For many afternoon sky watchers in North America, the moon will come to within about a degree, or two lunar diameters, of Dawn. As viewed by some observers in South America, the moon will pass directly in front of Dawn. For most Earthlings, when the moon rises on the morning of March 2, it will be north and east of Dawn. During the day, the moon will gradually drift closer and, from many locations, pass the spacecraft and the dwarf planet it orbits. The angle separating them will be less than the width of your palm at arm’s length, providing a handy way to find our planet’s emissary. Although Dawn and Ceres will appear to be near the moon, they will not be close to it at all. The distant spacecraft will be more than 1,300 times farther away than the moon by then (and well over one million times farther than the International Space Station) and quite invisible. But your correspondent invites you to gaze in that direction as you raise a saluting hand to humankind’s insatiable appetite for knowledge, irresistible drive for exploration, passion for adventure, and longing to know the cosmos. 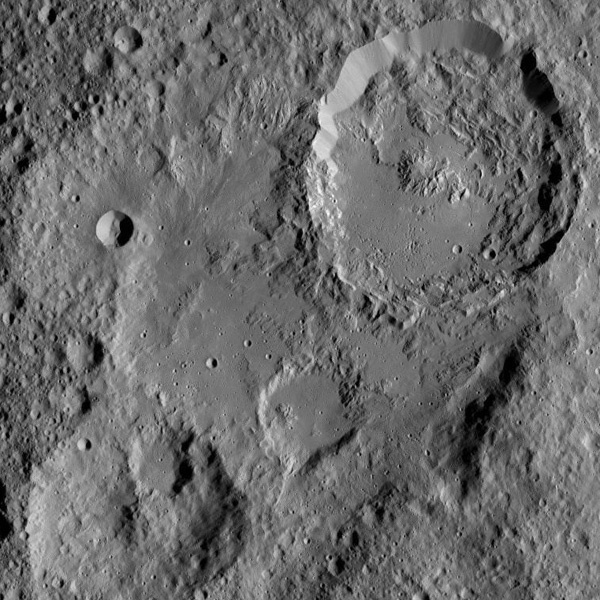 Dawn is 7,300 miles (11,800 kilometers) from Ceres. It is also 3.19 AU (296 million miles, or 477 million kilometers) from Earth, or 1,280 times as far as the moon and 3.22 times as far as the sun today. 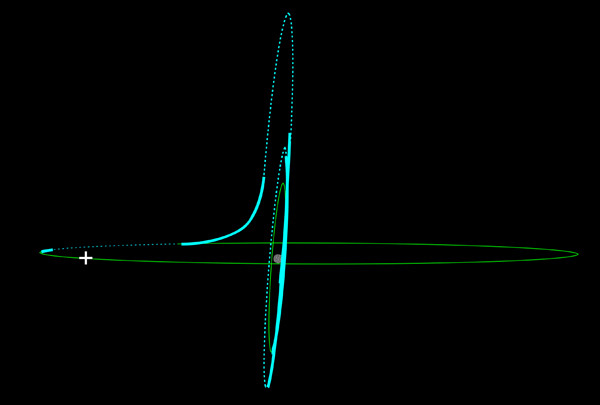 Radio signals, traveling at the universal limit of the speed of light, take 53 minutes to make the round trip.